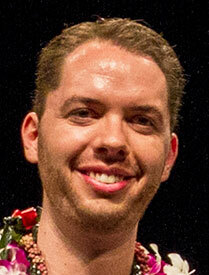 Rex Troumbley is a graduate assistant in the Department of Political Science at the University of Hawaii at Manoa. Troumbley’s primary teaching objective is that students leave his class understanding how power relations organize everything from the trash getting picked up to states going to war. He accomplishes this objective by combining political science methods for analyzing power with the tools students find useful for becoming engaged in their world. His research deals with how taboo language—cursing, swearing, profanity, obscenity and racial slurs—is managed by medical, legal and technical institutions in the United States. The Frances Davis Award for Excellence in Undergraduate Teaching recognizes dedication and demonstrated excellence as teachers of undergraduate students. It was established as a memorial to the late Frances Davis, who taught mathematics at Leeward Community College and UH Manoa for 19 years. Go to UH News for stories on the latest honorees. 2012–2015 | 2007–2011 | 2002–2006. Past winners from 2007–2011 and 2002–2006.